They FINALLY beat the Steelers! You have NO IDEA how fantastic this is! My Browns! They finally did it!!!! Yay!!!! Well, once again it is Friday! I cannot believe how fast the time has been flying by. I mean, Christmas is TWO weeks away! I'm not even done shopping yet, and we have a whole heckload of presents that need to be shipped up to Ohio ASAP! 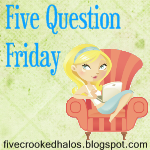 Anyway, Friday also means it's time for Mama M's Five Question Friday! 1) Does Santa wrap the presents he leaves at your house? My family's big celebration is Christmas Day. As I have mentioned before, I have a lot of siblings and this is the one holiday every year that we are all together. We have a huge breakfast, crowd into the living room where my dad always "plays Santa" and hands out the presents to everybody. Chaos ensues. I love it! Then we all check out what we got, the boys go down to my dad's man cave and play video games and pool, while the ladies chat and help mom with dinner. My mom cooks a HUGELY delicious dinner! She is the best! All the while have "A Christmas Story" on TV all day. Later on in the evening we would always play games, our favorite being spoons! It's a tradition, although it can get dangerous... My sister Maureen has been known to hurt people- she's a *little* competitive! We usually spend Christmas Eve with Jason's parents and his brother. A much smaller gathering than with my family, and much more low key. His mom makes dinner, we all open presents and then we watch a Christmas movie. It's a nice, relaxing evening! One thing that they do that I think is a little odd is that they only pass out one present at a time and everybody watches that person open their present. It always makes me feel a little strange... I have to admit! Jason agrees. But, his grandparents do the same thing at their house, so I guess it is part of their family tradition. I joke that if my family did that it would take about 10 hours to open all of our presents! Now instead of spending Christmas Day evening at my parent's house we head over to Jason's grandparents house. His grandma is a killer cook and makes a fantastic dinner, and bakes DOZENS of delish cookies! His aunts, uncles and cousins are there and we all get to spend time chatting and opening presents! It's a fun night, that usually ends with some competitive euchre playing! 3) Are you big on keeping tradition every year? 4) Do colored or white lights tickle your fancy? I HEART Christmas lights! I don't care what color they are! I have colored on my tree, and we used colored and white for outside. I'm not picky! 5) Do you decorate outside your house for Christmas? Yes! But, Jason has not had time to put our lights up yet. And no way is this preggo about to get on a ladder and string up those lights! I have a Christmas mat out and an absolutely GORGEOUS wreath that Jason's mom made me outside as decorations for now. Hopefully Jason can get those lights up this weekend! Emily! I thought that might be you from high school and then it was confirmed when I saw this post about the Browns. :) What an insane win! Congrats on your little one - we're only 3 weeks apart! Do you know what you're having or are you on "Team Green"? So exciting. Thanks for the post - I'm following you now!